They say Americans’ collective memory is very short, but Bayonne is an exception to the rule. Word travels fast in the isolated Peninsula City and stays there. Residents here seem to remember every scandal, budget shortfall, and big developer who’s come and gone in the last decade. These stories are not blips on the screen; they’re part of larger trends in the county, state, and country. What happened in 2016 will be relevant in 2017, so keep this Year in Review in your local news rearview mirror, where objects are closer than they appear. This year will forever be remembered for its elections. Cable news outlets ran election coverage around the clock for all of 2016, starting with the primaries in January. Sixty-five percent of registered Bayonne voters came out to the polls, with 13,238 votes for Hillary Clinton and 9,074 for Donald Trump, who would go on to win the electoral college, but lose the popular vote by 3 million. Only a couple of weeks after the election, a $2 million deficit in the district’s operating budget came to light, prompting the board to fill the gap with Regular Operating District (ROD) grant funds from the state. The deficit could not have come at a worse time for teachers, who have been without a union contract since the last one expired in July of 2015 – more than 17 months. The Bayonne Teachers Association (BTA) and the BBOED seemed to be making progress coming to terms on a new agreement, with teachers hoping for a big retroactive Christmas check that never came. Administrators have been crying “underfunding” for years, which is true. Bayonne opted out of becoming an Abbott District years ago, and now the city’s perpetual struggle to raise enough revenue from property taxes to make ends meet is hitting teachers’ pockets. A presidential race loaded with racial bombast hit home in October when a 20-year-old Bayonne man vandalized a local mosque on Avenue C, spray painting Islamaphobic messaging and one “Donald Trump” tag. This comes as the local Muslim community tries to relocate its Muslim Community Center from that location on Avenue C to an old building on East 24th Street in the Second Ward. That effort has been met with protests since the first zoning board meeting to address the matter was held in January of 2015. The hearing was postponed to March of 2016 and has been postponed three times since. The Board of Education voted in July not to renew Superintendent Patricia McGeehan’s contract, which ends in June, marking an end to McGeehan’s 17 years at the helm of the Bayonne Board of Education. The decision comes in the wake of Dr. McGeehan’s controversial attempt to evict the Police Athletic League from Midtown Community School, where she was principal from 1992 to 2000, to make way for an expansion of the district’s afterschool program. The eviction was met with protests and backlash from the community, including official statements from both Mayor James Davis and Assembly member Nicholas Chiaravalloti objecting to the eviction, which was rescinded at a special emergency meeting in June. 2016. The City of Bayonne saw a $13 million hole in its budget resulting from a development deal at the Military Ocean Terminal Base falling through in April. The city council voted to plug the gap by liquidating future revenue from the 2010 sale of the southwestern portion of the base to the Port Authority. The city effectively sold $45 million worth of deferred payments for $27.3 million to be used for both this year’s budget and future budgets. Teachers in Bayonne are feeling the brunt of economic stagnation; their salaries are paid by revenue generated from property taxes and state funding that are not keeping pace with the costs of public schooling. City workers, also paid with tax revenue, are being squeezed as well. Earlier this year, the city council called for a hiring freeze. Three employees who were laid off due to a lack of funding had their day in court when an administrative judge recommended they be reinstated after two city officials testified that belt-tightening of municipal finances was the cause of the layoffs. The judge ruled the testimony “not credible.” The final word on their reinstatements rests with the Civil Service Commission, who will issue a ruling in early 2017. Telecommunications workers at Verizon went on strike in April, holding signs on Broadway saying “Stop the war on workers.” Higher healthcare costs, temporary relocation of workers, outsourcing, and pension freezes were central to the dispute. It was the largest strike in five years, as across the country 40,000 workers represented by the Communication Workers of America picketed in the streets. The strike ended in June. Bayonne’s Military Ocean Terminal Base (MOTBY) is symbolic of the city’s evolution—from the industrial, blue-collar military town of old, and the luxury condo-happy city of today. MOTBY has come to represent everything good and bad in Bayonne. The two-square-mile swath of undeveloped waterfront land is a developer’s dream. But the 2008 recession and messy politics further hindered its development. Today, only one development stands in the vast emptiness of the base. The good news is that development plans have picked up steam and a grand vision for the base is coming to fruition. Two developers have been designated this year for development of Harbor Station South, one section of MOTBY. In his State of the City address in June, Mayor James Davis said, “You either adapt, or die.” His administration supports development in all parts of Bayonne, as does the city council, which approved and designated numerous developers both in the city center and along its outskirts, especially MOTBY and neighborhoods in walking distance of light rail stations. The Planning Board approved in April a ten-story mixed-use building to be constructed where Resnick’s Hardware store currently stands on 46th Street and Broadway. A 180-unit apartment building is scheduled for construction in 2019 on Avenue F near the 22nd Street Light Rail Station. What will be the city’s tallest building is planned for 26 North Street by the 8th Street Light Rail Station. The mixed-use building will tower over Bayonne at 22 stories and 244 feet in height. Public opinion has been mixed – not over whether to develop, but where. Some would rather the city not allow for development of tall apartment buildings in the city center, and rather focus on the waterfront. It’s a clash between the preservation of a small-town Bayonne and the big-town “destination,” many want it to become. Next year, will Bayonne stay the course with development and community building? Either way, developers will surely be knocking at the city’s door through 2017. These stories are not blips on the screen; they’re part of larger trends in the county, state, and country. What happened in 2016 will be relevant in 2017. The southern end of MOTBY is slated to become a park, including the last stretch of the Hudson River Waterfront Walkway that is currently fragmented. Upon completion, it will be a continuous walkway running from Fort Lee all the way down to Bayonne. The city council in December issued a Request for Proposals for a bike-share system that will give residents pedal power on that future river path. Parks in Bayonne are steadily being renovated to meet a growing public demand for open space. Dog walkers, seniors taking their constitutionals, joggers, and anyone who loves great views of the bridge and the waterfront are proving the value of city parks. 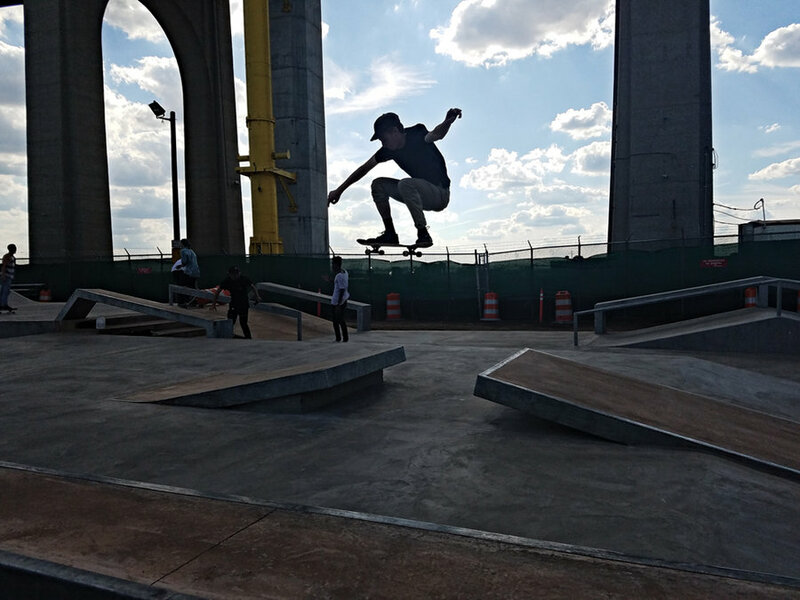 Skateboarders and BMX bikers were ecstatic when the city opened the 1st Street Skate Park next to the Bayonne Bridge. The all-cement park was dedicated in September to Tyler Sellers, a 20-year-old who died crossing Route 440. Bayonne has long been a community with a strong veteran presence. When the Department of Veteran Affairs came to Bayonne to host a claims clinic, issues with the department and with veterans more broadly came to light. Candid responses came from employees of both the VA and the Hudson County Office of Veterans Affairs. Getting veterans the information they need turned out to be a bigger challenge than many had thought. In honor of Veterans Day, Bayonne High School planted 1,000 flags on its lawn at the first “Field of Heroes” event. With three Medal of Honor recipients, veterans have forged Bayonne’s character as a town that has served its country with distinction. It’s been a long time coming, but 2016 may be the year JFK Boulevard cements the dubious distinction as Hudson County’s most dangerous thoroughfare. With increased attention nationally on infrastructure and design of urban areas, “the Boulevard” is in the spotlight. Traffic safety is an ongoing issue in areas where pedestrians share space with vehicles. An incident in late April was one in a long string of fatalities on the Boulevard across the county. Two teens were killed in early March by a vehicle that jumped the curb in North Bergen. Later that month, a five-year-old boy was struck by an SUV in Bayonne, causing minor injuries. On March 9, a woman was struck by a car while crossing the Boulevard in Jersey City. One mile-long section of J.F.K. in Jersey City, between Fairmount Avenue and Newark Avenue, has been ranked the most dangerous stretch of road in Hudson County by the New Jersey Transportation Planning Authority (NJTPA), which oversees, studies, and funds safety and transportation improvement projects. City officials throughout Hudson County are cooperating in an initiative called “Operation Slow Down, Save Lives,” to crack down on the 25 mph speed limit, jay walking, and to add crossing guards at the more dangerous intersections of the boulevard.